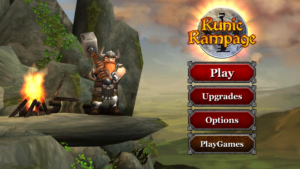 Game Info – Runic Rampage – Hack, And Slash Role Playing Game Developed By Crescent Moon Games. In This Game, You Play As Dwarf Who Use Hammer To Crush Enemies. Your Goal In This Game Is To Collect The Missing Rune Stone, Defeat All Enemies, And Defend Yourself. Game Starts With A Quick Story And Tutorial. You Are In A Desert With A Hammer. Use Controller To Move Left, Right. Follow The Compass And You Will Face Enemies Waves. You Have To Attack On Them With Your Hammer. Controls – There Are Two Types Of Button – Hammer, Shoe. Tap On Hammer To Attack On Them. This Would Be A Light Attack. Spinning Blow Will Help You When Waves Of Enemies Are Around You And Attacking. It Would Be Hard To Kill Dozens Of Enemies. Some Of Them Are Dragons And Can Attack On You With Fire Ball. By Killing Enemies, You Can Get Power-Ups i.e. Fire-This Will Make Your Hammer More Powerful. Other Power-Ups – Fire Wall, Inferno, Emblems-Powerful Magic/Attack And More. You Have Weapons Too. But Initially, Only Hammer Is Unlocked And Other Weapons Are Locked. You Can Upgrade Your Hammer, Strength/Attributes – Attack, Defense, Greed Also. Weapons – Heavy Mace, Headmaster, Bloodmace, Blood Thirster, Cavaliers Hammer, Epic War Hammer, Golden Eve, And Scepter Of Kings. Game Play – Follow The Compass, Face Enemies, Kill Boss, And Reach To Final Point. You Will Earn Gold And Other Rewards Which Can Be Used For Upgrading. There Are 5 Armor Sets Available. Battle Grounds – Desert, Frozen Forests, Caves, Mysterious. Graphics Of This Game Are Excellent, Gameplay Is Also Great, Controls Are Smooth. 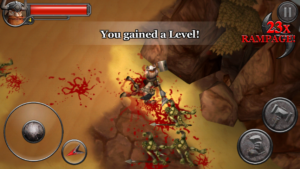 Overall, Runic Rampage – Hack, And Slash Is A Great Action Role Playing Game For Android. Price – Almost $4(Worth Every Penny), Size – 90MB(Approx.) Download – Here(Google Play Store). If You Have Any Game Suggestions, Please Submit Here. For More Best Game Updates – Like Us On Facebook – MrGuider, Twitter – @techhuntr, Subscribe Us.